I know it's corny to write "lobstah," but apparently, there is some unwritten law that says that in New Hampshire... er, I mean, New Hampsha... important words that end in -er should be respelled with a final -ah. Well, I'm not one to fully honor tradition, so I'll just use the word "lobster" from here on in, if only to soothe my poor spell checker. My family had lobster infrequently when I was growing up. I guess that was because it was seen as a "luxury" item. I remember going crabbing during the early 1970s (I should write more about that in another entry) and during that time, I developed a fondness for crab meat, but I usually only saw lobster as some sort of shellfish that was just expensive. I recall ordering lobster during one of my first dates with Sandra when I was in high school. Actually, I ordered the "surf and turf," which was steak and lobster. I truly believe that this was the first time I ever ate a lobster. It wasn't an entire lobster; it was a lobster tail, and I think it was already split for me. However, it was still served in its shell. About halfway through the meal, Sandra asked me, "Where's the rest of your shell?" I looked at her confused. "What are you talking about?" "You're not supposed to eat the shell!" From that inauspicious start, my attitude toward lobster has been and remains neutral. I really don't dislike it as a food, but I really prefer crab. When I was living in South Florida, lobsters were plentiful, but they (usually) weren't the traditional "Maine" lobster, but rather the "Florida Lobster," which is also known as a "Spiny Lobster." This lobster doesn't have the notable large claws of the Maine variety, and I think the Spiny Lobster's meat tastes a bit more like crab to me. 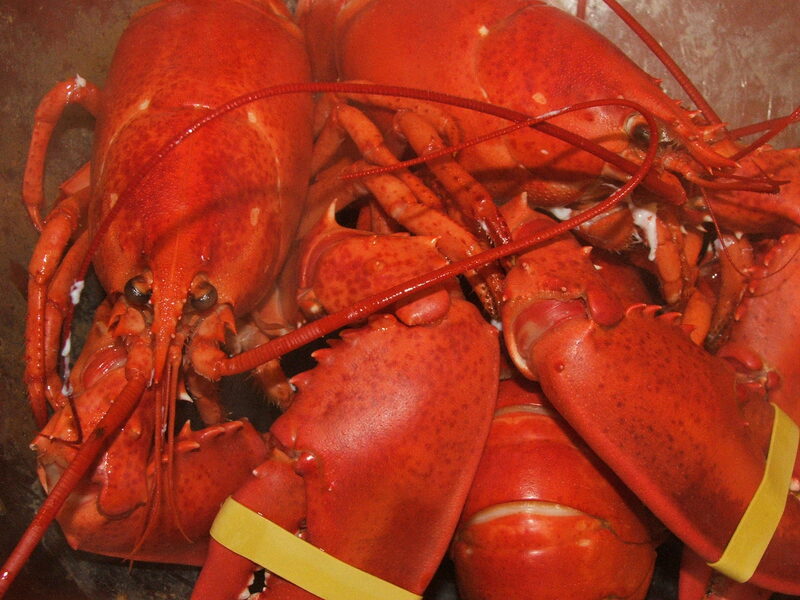 There were places where you could get Maine lobster, but they were expensive. Living up here in New Hampshire, I am lucky (??) enough to be able to get lobster at better prices than anywhere else I have lived. I remember seeing twin lobsters being offered as low as $12.95, although I don't see twin lobsters being offered much at all nowadays, and when I do see them, they start at about $20 for the pair. Cooking a lobster is easy. Simply fill a lobster pot with water, add salt, and wait for it to come to a boil. Insert the lobster, face down, and boil for 10-15 minutes, depending on the weight. Of course, just mentioning that much can get me into hot water myself: there is a long-running controversy as to whether or not lobsters can feel pain, and whether it is humane to throw a live animal into boiling water. I'll leave it to the moral ethicists, zoologists, scientists, and chefs to throw the arguments around; I haven't heard anything definitive on either side, although Wikipedia seems to have a pretty good rundown on the issue. Over the last few years, I've noticed at least one grocer in town (Market Basket) tends to have the best prices for lobsters, with them usually available from $4.99/pound to $6.99. Usually, these are soft shell lobsters; lobsters tend to shed their skin, and when they have just replaced them, they start growing new, larger shells. Some people prefer the sweeter meat of the soft shell lobsters, while others dislike the relatively smaller proportion of meat to shell and prefer the hard shell lobsters instead. I remember a visit to Gilford, NH, that Sandra, the kids, and I took. It was the Saturday at the start of Motorcycle week, and for some strange reason, we were not only able to get a reservation at a motel in the lakes region, we were also able to get a suite. With the restaurants in town catering to the motorcycle crowd, I decided to go to a local grocer to see what I could make in the kitchen in the suite. I found lobsters at a good price (about $5.99/pound, but my recollection could be off; it was relatively cheap, though). I purchased one each for Sandra and the kids, and then paid a bit more for a pound or so of Jonah claws (I mentioned that I preferred crab meat!). I then stopped at a nearby WalMart, and picked up a lobster pot. Even including the price of the pot, the meal we had was much less than going out to eat and having an equivalent meal at any restaurant! I travel to Maine quite a lot, and have found some really wonderful lobster restaurants there. I remember visiting a place called the "Lobsterman's Coop" (now called "Boothbay Lobster Wharf"), in Boothbay Harbor, Maine. More often, we go to the Cape Neddick Lobster Pound in Cape Neddick, Maine, and the Chauncey Creek Lobster Pier in Kittery Point, Maine. We prefer Cape Neddick because it's a more formal restaurant with a bar, lounge, and is open year round. However, Chauncey Creek offers a more informal setting with picnic tables and a "B.Y.O." policy so that you can bring in your own beer, although it's only open during the warmer months. Here in New Hampshire, there are quite a few places to get lobster. One of Sandra's favorite places is Weathervane, which has a restaurant in Salem, NH, as well as many other places in New England. Unfortunately, unlike Maine, I haven't really seen as many places that are simply dedicated to lobster as the many lobster pounds in Maine. I think this is because New Hampshire only has about fourteen miles of shoreline...! As I said, I don't really dislike lobster, but until I find a good enough excuse to actually start eating them and (hopefully) eventually start enjoying them, I think I'll stick with my crab meat and leave the lobsters to my wife and kids!